Shinleaf is a perennial, evergreen herb, 5-10 inches high; a slender, branching rootstock produces a set of basal, dark green, ovate to elliptical leaves with margined petioles and shallow-toothed edges. The naked flower stalk bears from 7-15 white, waxy, drooping, greenish-white flowers, which smell like lily-of-the-valley and bloom from June to August. 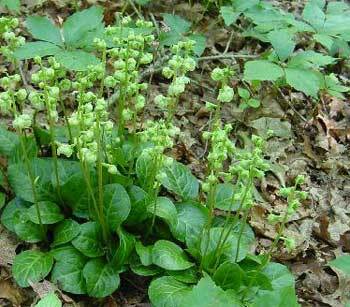 Grows in dry to rich woods in Canada and in the northern and Rocky Mountain states of the United States. Maryland, West Virginia; Nebraska and across Canada to Alaska. Webster’s Dictionary claims this herb belongs to the Heath family; some references claim it for the Wintergreen family, who knows. Has a mild astringent property and can be used as a mouthwash, gargle, and vaginal douche. The leaves make a good poultice for insect bites, bruises, and other skin problems. Native Americans used the tea of the whole plant to treat epileptic seizures in babies; leaf tea gargled for sore throat, canker sores; poulticed leaves for tumors, sores, wounds, ulcers, and cuts; root tea as a tonic.